Albert Einstein discovered that time should be seen as a fourth dimension that can be added to the three dimensions of space. What exactly does this mean? Can one imagine higher dimensions? How does geometry work in four-dimensional spacetime? And how does this help us understand fundamental questions in physics like the Big Bang, black holes, and the behavior of elementary particles according to the rules of quantum mechanics? This page is for the 7:00 pm session. Click here to register for the 4:00 pm session instead. Light refreshments will be served after the 4:00 pm session and at 6:30 pm in advance of the second session. 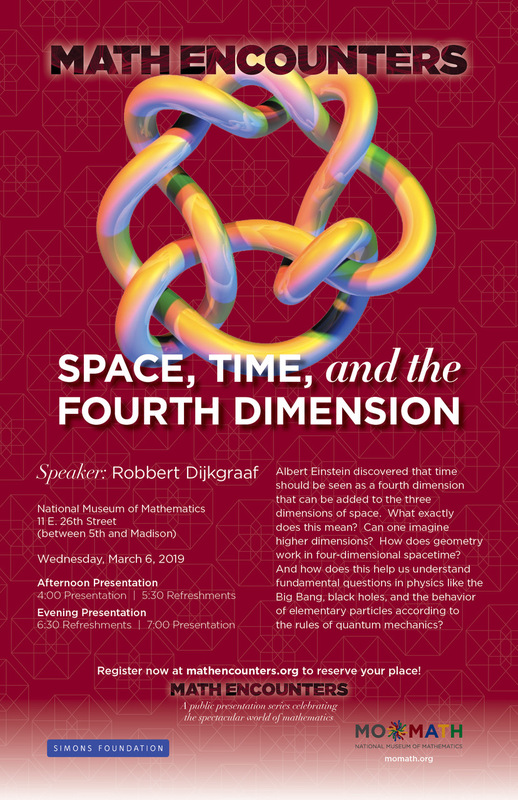 Math Encounters is a public presentation series celebrating the spectacular world of mathematics, presented by the Simons Foundation and the National Museum of Mathematics. For further information, call the National Museum of Mathematics at (212) 542-0566 or e-mail mathencounters@momath.org. Please check our online shop for books by Math Encounters presenters.